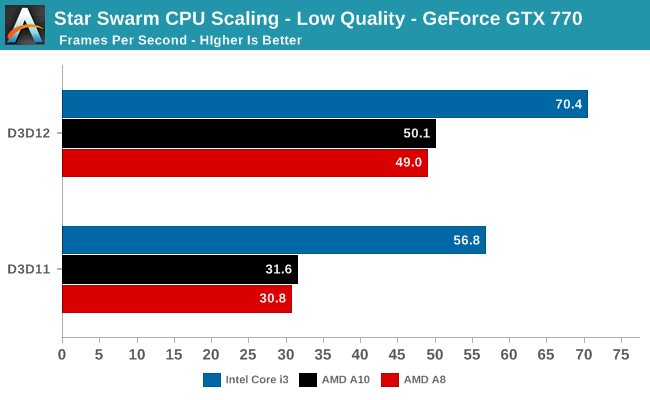 After the interesting DirectX 12 Preview with Radeon and GeForce graphics cards, Anandtech has also covered performance gains obtained with DirectX 12 on AMD Kaveri APUs which feature support for the new API versus Intel’s Core i3 processors which are available around the same price range. 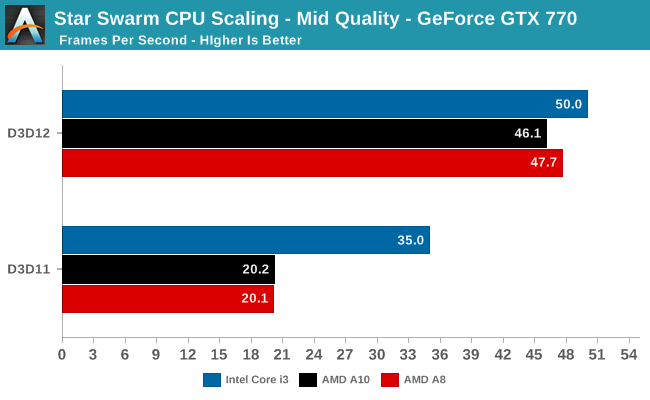 The previous benchmarks were to show how well high-end CPUs performed with the new API with several GPU configurations. These new scores shows how the budget tier scale utilizing the new API. The processors being compared include AMD’s A10-7800 and A8-7600, both of which are part of the Kaveri APU lineup. Both processors are compared against the Intel Core i3-4330 (Haswell) processor. The A10-7800 costs around $141.99 US while the Intel Core i3-4330 costs $129.99 US. The cheapest of the bunch is the A8 which retails at $99.99 US. While Kaveri parts are both Quad Core variants featuring the x86 Steamroller core architecture, the Haswell Core i3 variant features dual cores hence performance is expected to take a hit from benchmarks that utilize more cores however DirectX 12 and Mantle APIs were built to assist applications to utilize more raw performance from the CPU. From previous reports and official information, we know that AMD’s Kaveri APUs and Intel’s 4th Generation Haswell lineup features DirectX 12 compatibility. AMD has already featured Mantle API support on all of their Kaveri and GCN enabled product lineup. The performance tests were done using the StarSwarm demo which was the first public benchmark to showcase Mantle in action and we did our own testing to show how the API worked. 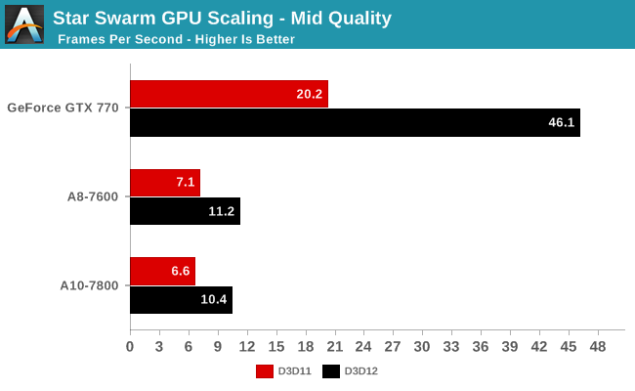 While Stardock, the creators, are working on something new for GDC 2015, several sites still use the benchmark to show a valid comparison on DirectX 11 and Mantle API performance gains. The performance was tested on the processors coupled with a GeForce GTX 770 Lightning as mentioned in Anandtech’s setup table and the results do come out interesting. It shouldn’t be a surprise to know that the discrete level gaming performance on Intel processors is better and the Steamroller cores did lack in performance at launch. With DirectX 11, the performance difference between Kaveri and Core i3 parts is pretty huge and is only slimmed down with DirectX 12, not completely washed away. The new API does help steer performance to the same levels on Extreme quality, the performance at Medium quality lags around 2-3 FPS behind but is highly degraded at low quality. Due to poor single threaded gains on Kaveri APUs, we can see gains of as high as 50% on Core i3 models and the scenario becomes more intense when more Steamroller cores are tasked upon compared to just two Haswell cores under DirectX 11. 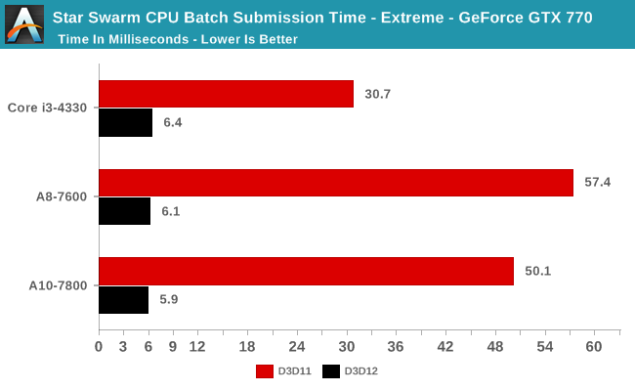 The batch submission time for each CPU however shows at time of around 6ms averaging for each processor which mean that single threaded performance wouldn’t be a great issue under DirectX 12 as with DirectX 11. It doesn’t goes out without saying that there’s no performance gain on Intel’s own processors. 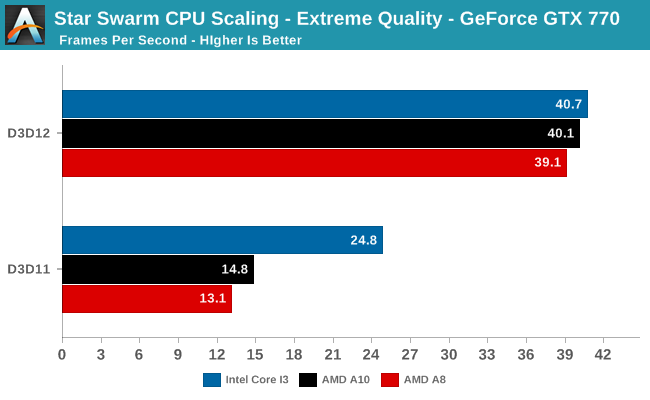 The Core i3 witnessed a big jump throughout the benchmarks and its performance is a step higher than AMD’s Kaveri APUs. Intel has several processors planned to gain benefit from DirectX 12 in the future with their upcoming 5th gen Broadwell and 6th gen Skylake processors which will obviously get performance gains in the vertical direction. 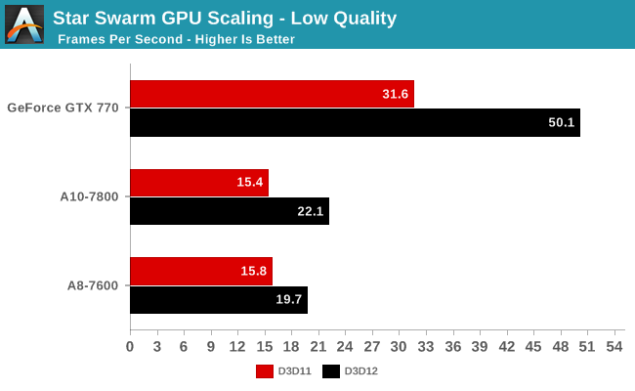 AMD on the other hand would have to rely on clock speed bumps and optimization on their current processors since they have no immediate plans to update their APU/CPU lineup. The only Godavari APU lineup which is expected to hit in mid of 2015 will be a refresh based on the current Kaveri chips while the Zen based Summit Ridge high-performance CPUs and Excavator powered Bristol Ridge APUs will hit the market in late 2016 that will end up competing with Intel’s 10nm “Cannonlake” counterparts. There’s also a iGPU bench which shows gains in GCN performance on the same Star Swarm demo. The results here show a 44% gain on A10-7800 and 25% gain on A8-7600 with the DirectX 12 API versus DirectX 11. The GeForce GTX 770 pushes for its own performance leverage with the new API however its surprising that there were no Mantle performance tests shown in the preview. As for what future prospects does DX12 hold, the API is set to become available this year with Microsoft’s latest Windows 10 OS. AMD is currently working on their new GCN cards which should adopt both Mantle and DirectX 12 API, NVIDIA on the other hand has added DX12 support on GPU generations spanning from Fermi, Kepler, Maxwell and beyond. NVIDIA also has leverage in performance with DirectX 12 due to the optimizations they added for the API during the 337.50 edition drivers. Intel has also hoped abroad the DX12 bandwagon with their 4th generation processors and the upcoming 5th “Broadwell” and 6th “Skylake” processors.